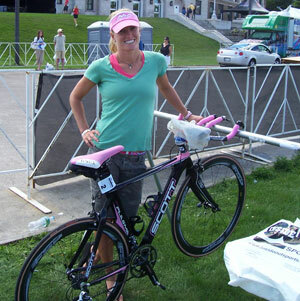 Former professional triathlete, Amanda Lovato, provides some insight to her first triathlon. See her thought process as she took on her first triathlon. Keep this in mind as you train for Rookie Tri, the first triathlon of your life, everyone starts in the same exact spot! I needed a goal. I was chubby, unhealthy, unhappy, and only 25 years old. Being athletic in my high school and college career, I realized I needed to try something new to help me focus on being healthy again. After a lot of consideration, I signed up for my first triathlon in February 1997. That February, I made a commitment to compete in the St. Anthony’s Triathlon in Tampa, Florida, only two months after my “start to train” date. I did this purposely. I needed a goal that wasn’t too far in advance. But I also needed to make sure that I stayed on task with my training and my goals. The first thing I did was hire a coach. I knew I needed some assistance in learning the “ropes” of triathlon. I had never swum in my life. I mean I could possibly save myself if I had a life preserver strapped on, however, I didn’t know proper technique. My coach invited me to join the masters swim program. After day one, I was hooked. I’m not sure exactly why as I look back on that fateful day. I was splashing around in a cold pool at 5:30 in the morning. I was kicked. I was yelled at. I nearly drowned. I didn’t know anything about pool etiquette. In fact, before workout that morning, I informed coach that I could swim 1500 meters in 19 minutes. I believed this because at the time my college boyfriend swam a 15:39 in the 1500 at the Olympics. In my mind, 19 minutes was equivalent to a 10-12 minute mile on the track. I was SO WRONG! Nevertheless, my coach helped me to believe that I could actually finish a triathlon. I trained so hard leading up to the race that I was very tired every single day. I celebrated my days off on Mondays! As the day of the race quickly approached, I was more nervous than ever. However, I was determined. I was determined to race as hard as I could. And I was determined to finish! Coach and I talked about everything before I left for Tampa (from Baltimore). He encouraged me to have a bike shop look over my bike before I raced. He told me what time to eat the morning of the race, as well as what to eat. He told me exactly what sort of times I should be expecting for each segment. I felt very encouraged to have this much support. As I arrived, I followed everything he told me to the “T.” However, I do wish he had told me to not eat a huge steak the night before the race. That was definitely a rookie mistake! As the gun went off, my heart nearly stopped! But then my competitive juices took over and the feelings of being scared and nervous disappeared! I was in the mix of all of the kicking and scratching for an entire 30 seconds before everyone seemed to disappear. I was alone – swimming along for 1500 meters. I kept on encouraging myself to keep going. I could do it! It took me 36 minutes to swim the distance – I did it! Now off for the bike! The bike seemed to be the most effortless of all. I loved the feeling of going fast. I could really push myself! Unlike the swim, I could work really hard and feel like I was going somewhere. I was pushing as hard as I could possibly go! As I entered the second transition, I knew that I had the run in the bag! What I didn’t anticipate, however, is what my legs would feel like after getting off the bike after riding so hard. I hadn’t pushed myself to the limit on the bike like that, so when I got off I just wanted to lay down! I was so tired! Through the run I lumbered, I struggled, I walked, but I worked as hard as I could to finish. My run time (for the 10K) was 55 minutes! I was ecstatic! I had finished my very first triathlon! I was absolutely hooked!!! I never would have thought that 11 years later I would be doing this as a professional and telling the story of how I first started. It just goes to show that if you put your mind to something and if you make goals for yourself, you can do anything! Go for your dreams!